Our clients are best able to cope with stressors and triggers when they’re operating within their window of tolerance. 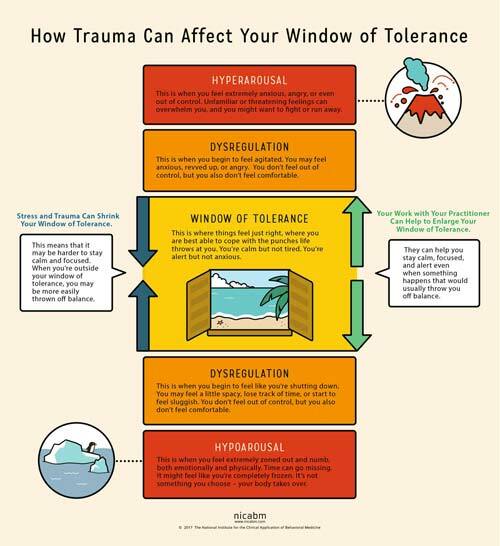 But a traumatic experience can narrow our clients’ window of tolerance, leading to states of either hyper- or hypo-arousal. So we created this infographic as a tool you can share with your clients. It can help you explain what’s going on when they’re feeling dysregulated. Plus, this will help to support the exercises and work you do together as an important part of healing. 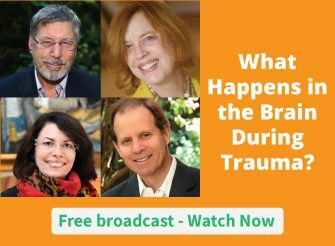 For more strategies you can use to help clients who’ve experienced trauma, be sure to check out the Treating Trauma Master Series. You’ll get insights from Bessel van der Kolk, MD; Dan Siegel, MD; Pat Ogden, PhD; Stephen Porges, PhD; Peter Levine, PhD; Allan Schore, PhD; and Ruth Lanius, MD, PhD. It’s free to watch at the time of broadcast – you just have to sign up. Now we’d like to hear from you. How could this help you in your work? Please leave a comment below. Thank you! It really useful infographic. I will propose it to my director. I work in a company which produces content (https://adsy.com/), so right cooperation with client one of the most important parts of success. Thank you for the detailed and informative Window of Tolerance. It helps me to know I can be in the window zone no matter how small or large it is at any given time. It doesn’t have to be, ‘I’m all in’ or ‘I’m all out’. I like that. Hi! Do you have this infographic in Spanish or Somali? I love this infographic and use it regularly with clients. Do you have it in other languages, I am particularly interested in Spanish and Somali. Thank you. This is very helpful to share with clients and helping with psycho-education. It helps them to make sense out of the frightening feelings they have when their body takes over. I have found using it alongside a trauma informed perspective rapidly reduces the shame they feel at getting lost in these states. Thank you, this visual will be of great help!